The recreational opportunities listed on the webpage for Netarts Bay are brought to you by wwww.clamdigging.info for the benefit of the members of the Clam Digging and Crabbing Community. 23.4 north 14.5 south Netarts Bay is one of the pearls of the Three Capes Scenic Loop. The bay, Oregon’s sixth largest, is more like a tidal basin than a bay because it receives a limited amount of freshwater from the small streams flowing into it. The absence of a large river flowing into it, plus the isolation of the bay, has spared it from the effects of human development that have degraded the water quality of Oregon’s other large bays. Oysters grown in the bay are renowned for their quality and flavor because of the high salinity of the water. The freshwater entering the bay has minimal effect on the salinity of the saltwater in the bay and for this reason the bay is noted more for the excellent crabbing and clam digging than for fishing. Click on the image of the chart to enlarge it the maximum size. Navigational information for crossing the bar at Netarts Bay. It is dangerous to attempt to cross the bar at Netarts Bay at anytime. Use caution when boating in the lower bay. Plan your boating activities to clear of the lower bay prior to low tide. The high velocity of the outgoing tide can pull a small boat across the bar into the surf. Click on the image of the map to enlarge it. 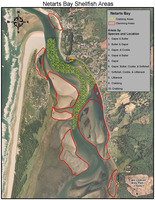 Click on the Seacor Shellfish Areas for Netarts Bay to link to ODFW's maps of the shellfish. 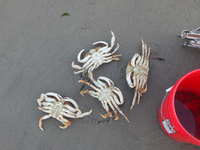 On 4/05 Zach at 1 503 842 7443 reports: Crabbing has improved to half limits per Dungeness crabs. Zach reports that the red rock crab are molting. Clam diggers have to exercise caution when venturing out onto the tidal flats. It is easy to forget about the incoming tide and become trapped by the incoming tide. Earlier this this year, Zach reported improved crabbing for from a rental boat. Click on the segment shown on KATU's Afternoon Live. The video segment was recorded on Halloween/2017. Crabbing slowed just from the shear weight from the number of crab pots in the bay. While some crabbers are taking low numbers of crab in the double digits. Most crabbers are taking single digits of 1 to 3 crabs. This crabbing season 2017 - 2018 is the best crabbing year since 2010. Remember crabbers who rent boats do not spend as much time on the water as crabbers who own their own boats. We encourage crabbers to return soft crabs to the water........ Al and Lorna not only rent boats for 80.00 for 3 hours. The boat rental includes 3 rings or pots with bait Additional crab bait bags run 1.50. Cooking crabs runs 6.00 a dozen. Zach and Katie run a first class operation with full hookups and pull thrus. Call I 503 842 7443 or toll free 1 877 651 9342 for information or reservations. On 11/27/17 crabber Joseph scores a giant turkey crab complete with pinchers at Happy Camp at Netarts. Joseph's wife Christa took the photo. They only caught the one crab so there is more work to do. Double click the image to expand the image to screen size. Oh boy! On 10/31 saw us taking Halloween crabs at Netarts Bay. We managed to take 4 Dungeness crabs before the incoming limited our ability to reach the channel that was active with crabs. Happy with the four crabs we caught we cooked them at the Big Spruce R/V Park. Eating fresh caught and cooked dipped in garlic butter is as good as it gets. Click on the image several times to enlarge the image of the crabs we caught at Happy Camp to it's maximum size. Last summer found one lucky crabber reported catching a starry flounder in his Crab Max crab trap from the shore at Happy Camp. Click the image several times to enlarge it. Having the need for fresh crab I purchased three from our local market. Oh Boy! The Louie taste so good even my wife loved it. The crabs were fresh which enhanced the flavor of the Louie, but it as the homemade dressing with fresh grated ginger that really set it off. 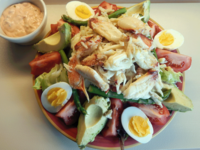 The photo of the Carb Louis is as good at the Crab Louis tasted; so, I use it when referring to all images of Crab Louis. Large gaper clams can be located at a depth up to 39 inches under sandy substrate making nearly impossible to dig without a cylinder to keep the sand from caving in filling the hole. The gaper clam in the video was not as deep as hoped for but what difference does it make. On August 11 After visiting the tidal flats on the west side of Netarts Bay and failing to find any clams where we usually dig them, we located a large tidal flat of amazing abundance of bay clams further up the bay. What was so amazing was the area showed no signs of anyone having dug clams from the area. We were going to dig our usual mixture of bay clams but could resist taking limits of fist sized cockles showing at our feet..
on 06/09/12 the trip from Netarts Bay offered a great view of the Elk grazing at the property of the Tillamook Air Museum. I was so excited at seeing the elk on my way home from digging clams at Netarts, I had to stop and film them after taking Josh Kline clam digging at Netarts. Josh Kling and friends went clam digging at Netarts Bay for gaper and butter clams. The group camped at Cape Lookout State Park over the weekend. I had a great time heling those folks that were new to digging clams. On 09/08 I returned to the tidal flat today with several friends to document the abundance and diversity of the clam species only to find that other diggers had also discovered the area. The three of us dung limits of blues (horsenecks), butter clams and Manila clams and filled in the holes that we had dug. However, the other diggers who proceeded us did not fill in the holes they had dug leaving the area with the appearance of a lunar landscape. Who's responsible? The ODFW shellfish staff of the Marine Resources Program, Caren Braby, Steve Rumrill, Mich Vance, Justin Ainsworth, Scott Growth and others at the direction of the senior management staff at ODFW's Fish Division, that's who!!! On 06/29 my buddy Walt and I walked in at the Whiskey Creek fish hatchery looking for Steamer Clams. We found the digging few and far between. The size and abundance of all species of bay clams continues to decline. We both took home limits of Manila Clams but we picked up most of the clams from surface of the substrate. On 05/18/14 My wife and I visited Netarts Bay to butter clams and Manila clams. It was her first clam dig. We had a great time..
On 08/01/12 My friends returned to Netarts Bay to search for large softshell clams but without success I managed to dig but one softshell clam; however, diggging for gaper clams, butter clams and Manila clams was productive as shown below. On 07/21/12 I was not satisfied with the Manila clams I dug on 07/17 and returned to Netarts Bay to dig for larger Manila clams. My effort was rewarded when my clam dog and I tried another spot further up the bay. The 5 inch softshell clam was a surprise and I intend on returning tomorrow to see if the old man has enough juice to dig a limit of softshell clams and a limit of bay clams as shown below. 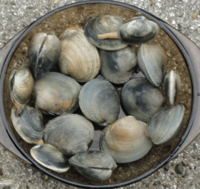 On 07/17/12 My wife, Diane and I drove to Whiskey Creek to dig for Manila Clams, but it was raining when we arrived and Diane waited in the SUV while I dug clams. I met a young lady who had raked a limit of Manila clams leaving the Fish Hatchery and asked her for a heads up on where to go. She told me to go past the stick sticking out of the mud and go north to dig clams. I followed her advice and dug a limit of Manila clams. It was not until I set down at home and viewed the video of my clam digging adventure that I realized the meaning of the series of the sticks in the mud extending across the tidal flats. Are boundary markers for the Shellfish Reserve? While I was out digging clams my wife informed me that an OSP officer drove into the parking area and disappeared into the tree. The importance of the sticks in the mud and the OSP officer walking into the trees became apparent. Was he looking for diggers digging in the Shellfish Reserve? I looked in the 2012 Oregon Sport Fishing Regulations and could not find any reference to boundary location markers. I had a great time digging Manila clams at Whiskey Creek. You will enjoy raking for Manila clams there. On 06/04/12 I went clam digging for razor clams on Cape Lookout Spit. I dug 1 razor clams out of the 3 shows in the wet sand. One of the other 5 diggers had 2 razor clams. I noticed a number of molted female crab shells on the beach, which means the males are still being occupied by the females outside of the bay. Crabbing in the bay is still slow but has picked up somewhat. My buddy Rick and his daughter dug limits of mostly butter clams from the tidal flats in Netarts Bay. We took his boat and looked for clams on the isolated tidal flats near the mouth of the bay. Rick dug one 5 1/2 inch razor clam. It was the only one we found. However, we did find a small pocket of large gaper clams, that we will dig the next time out. On 06/02/12 and 06/03 Clam Clinic Netarts bay was attended by 42 participants dug limits of bay clams. On 08/29/11 my buddy Bill (RIP) asked to dig some steamer clams, so off to Netarts Bay we went. You have to work to dig limits of steamer clams at Netarts Bay and today was no different. What a great day it turned out to be. With a little instruction, Bill dug his second limit of steamer clams. His first limit was taken from the Hood Canal years ago. My wife wanted some chowder so I dug butter clams to make a small batch of tasty creamy style chowder, but I took the time to dig 6 steamer clams for taste treat for myself. Netarts Bay and Coos Bay are the two Oregon's Bays that have a verified population of geoduck clams but the clams are seldom found in the intertidal zone. Clam digger Jim knew what he was looking at when he saw the neck of the geoduck. View the NOAA Tidal Projections and click on your area of interest. View Tbone Tidal Projections for Netarts Bay. The FREE paper, Click on the Oregon Coast Today prints all the information about everything to do with the Oregon Coast. Monitoring Beach Water Quality with New Beach Action Values established for the 2017 beach monitoring season thereafter The Oregon Beach Monitoring Program (OBMP) is beginning a process to adopt a new beach action value (BAV) for bacteria of 70 MPN that will be used as the basis for public health advisories at Oregon beaches starting in 2017. The 2015 and 2016 monitoring seasons will remain unchanged and continue to use the current BAV of 158 MPN. Redtail surfperch, pileperch, walleye surfperch, silver surfperch, striped seaperch and white seaperch enter the bay for most of the year to feed. Fishing ranges from good to excellent from spring through fall and from poor to fair in winter. Fishing is excellent at the Boiler Hole just south of the boat launch in the lower half of the bay and in the channels adjacent to the tidal flats. Kelp greenling, whitespotted greenling and rock greenling enter the bay with the tide. The best fishing occurs during the fall and in the spring in the lower bay. Sea trout and perch are often caught in the same areas. Black rockfish and copper rockfish are caught in Netarts Bay but the fishing is inconsistent. 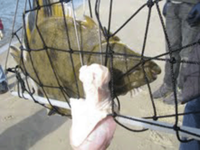 Starry Flounder fishing ranges from poor for most of the year to fair in early spring. Mile by Mile Guide from Netarts Bay to Sand Lake. 15.4 north 22.5 south – Cape Lookout is located between the Sand Lake Recreational Area and Netarts Bay off of the Cape Lookout Road. The cape is renowned for the panoramic view at the end of a 2.5 mile trail. Anderson view point is a favorite launch area of Oregon’s hang gliders. 11.0 north 26.9 south – Sand Lake Beach is located north of the entrance to Sand Lake and below Cape Lookout. The fishing for surfperch is outstanding at the entrance to the tidal basin. Turn west from Sand Lake Drive onto Galloway Road. Follow the road 2.4 miles to the Sand Lake Recreational Area and the north Shore of Sand Lake. The recreational area is renowned for ATV use. The recreational area is a full use park with ample parking for all vehicles.